f you saw the trailer to Traffik, you don’t know the whole story. It looks like a fairly straightforward thriller about a couple menaced by criminals at their vacation home. There’s more to it than that. Traffik touches on human trafficking, but as a thriller that invades the lives of these sheltered couples. Paula Patton finds herself embroiled in human trafficking in Traffik. Monsters and Critics: Is it your goal to make movies that can be entertaining while addressing social issues like Supremacy and Traffik? Deon Taylor: Yeah, Supremacy was actually different for me based on the fact that I made that film more so as a festival movie. That was a really hard movie for me, just because I had spent a lot of time interviewing in prison and being with the family that this happened to. That was a tough movie for me. I like things that are grounded in reality. You don’t always get the best responses from a lot of people but what I love about it is being able to tap into humanity. I’m a very real person. I had a very tough life growing up. My mom, single family home, we’ve been homeless, we’ve been shot at. We done went through it all. What tends to happen as you get older and you are blessed enough to be able to tell a story, especially independently, I tend to find myself gravitating to things that deal with humanity, deal with reality, deal in real situations and deal with seeing people in turmoil and then how do they come out of it? How do you respond through adversity? That’s Supremacy and Traffik as well. M&C: Is Supremacy a festival movie because you expect festival audiences to be more accepting of challenging movies? DT: When I said that, I meant that’s what it was. In other words, I knew that movie wouldn’t commercially find a theater, but I wanted to make a hard movie. I wanted to have a movie that used the word n*****. I wanted to have a movie that was violent because racism is not nice. And this guy was not nice. Ultimately, what I wanted that movie to demonstrate was racism is learned. You’re not born genetically racist. At the end of the day, black and white get along and these guys hug and found a relationship through an act of violence. I just knew that, so the grittiness of me shooting in 16mm coupled with what the content was about, I just always knew that movie would be what that was. I wanted to do that as an African-American filmmaker. I wanted to tell a story like that. I didn’t want it to be weighted black or white. I wanted it to just be both. 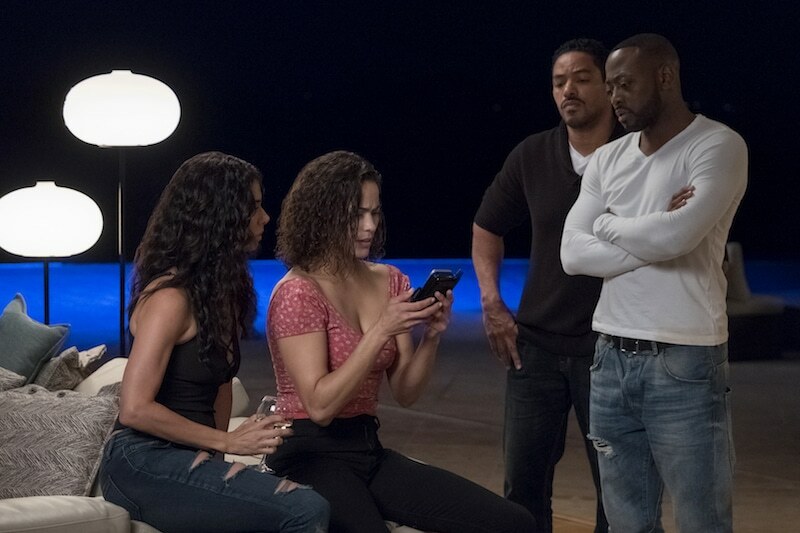 Roselyn Sanchez and Paula Patton see something they shouldn’t have in Traffik. M&C: Do you want to alternate these kinds of movies with straight entertainment like Meet the Blacks? DT: I think that’s the balance. For me, I’ve never been to film school. I don’t know what they teach there. I don’t know what the proper etiquette is for directors. I think what I love about it is a balance. I think you have to do doses of things in order for you to have clarity. I see a lot of filmmakers make one movie every three years and it’s something that everyone’s like, “Oh my God.” To me, there are so many relevant stories and so little time here on Earth. For me, I just feel like I don’t want to always be one way because my character is, I’ve laughed through pain. So comedy is something I love. If you’ve ever hurt or if you’ve ever been through something, I’ve sat in the house before and had no lights. I just remember I could laugh at a funny joke or my mom would make a joke and we’d all laugh. So comedy is important to me. 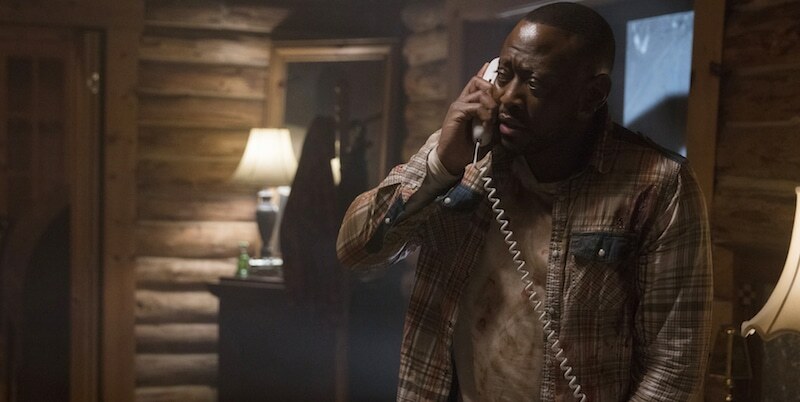 Omar Epps and Laz Alonso stumble onto trouble in Traffik. Thrillers are important to me based on the fact that those were the movies that we went to see, we went to rent. I have a special place for those. The reality world is what we’re doing now with Traffik is blending the lines. Being able to take a really, really high profile dirty thing like trafficking and placing it into a world where people can consume it through a different way which is a thriller. I think that is something that I’ve been working on for a long time in terms of blending art. M&C: Was the idea of the trailer not to let on the surprises of the second half of the movie? DT: Yeah, I cut that trailer. That trailer, what I wanted to do, the movie is so complicated in terms of the storyline and what it’s doing. When we had the name Traffik, I felt like the trailer should be a little longer. It should have a little more energy so you could see what it is. So we don’t do some spicy quick thing and you’re like okay, what is that? This is where the trailer to Traffik ended. M&C: You’re still dealing with delicate, vulnerable situations for women. How did you make the actresses comfortable on set? DT: Because I’m a fan of strong women. My mom raised me. My wife is the lead producer on the film who leads me all the time. I just knew what the feeling was. I knew what the energy was. I knew what space we’re supposed to be in. We were able to also get some incredible women to be involved with the movie as consultants, that had been trafficked. One woman who was trafficked for years and ultimately became a trafficker. So being able to sit with people that have been down that road, I was like, “Whoa.” I knew it was a movie about strength. So many times we see men beating up gorillas and fighting. For Paula it was like how do you make a movie where she’s fighting for survival but at the same time she’s being strong and scared? I thought we nailed that here. 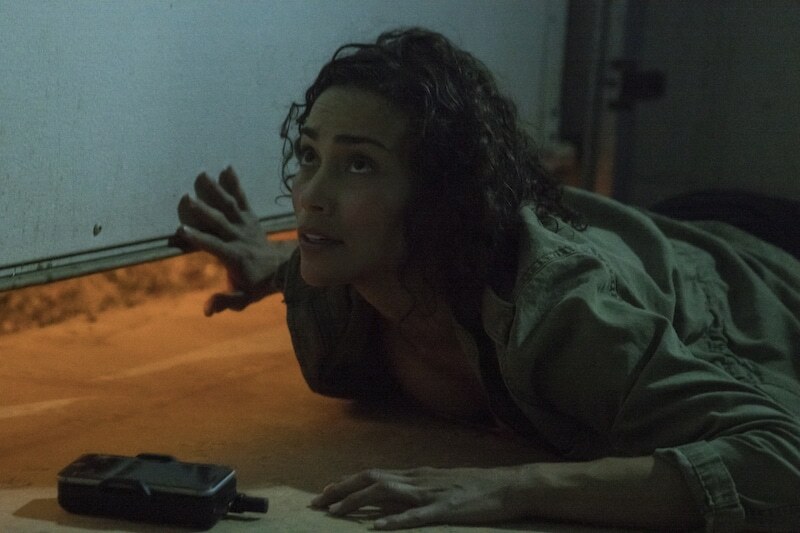 Paula Patton goes beyond a home invasion in Traffik. M&C: What was something in particular that one consultant gave you that gave the movie more authenticity? DT: I realized that the rings are really working this way. This is not fiction. This is real. I started finding out that women are used predominantly as the trafficker because they come with the face of an angel, if you will, versus a man. Who’s better to traffic a child or a little boy or another woman but a woman? I said man, this is deep when I started hearing how they do it. Who they send into the restaurant, who they send into the bathroom, because you’re not looking for that. 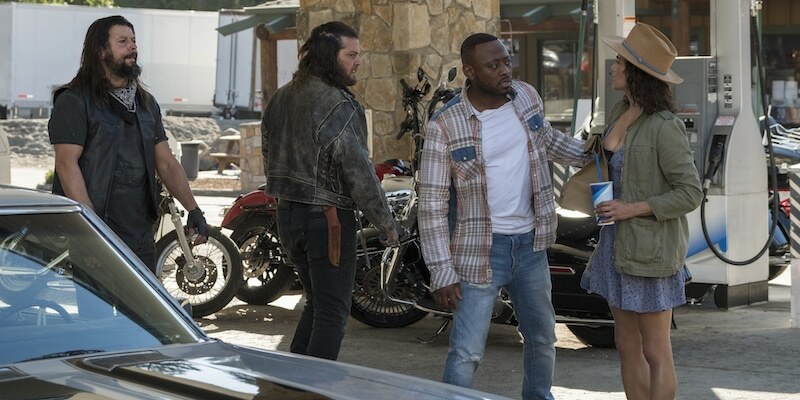 The bad guys harass Omar Epps and Paula Patton in Traffik. There was no movie that stuck out more to me than the movie The Vanishing. That film still to this day haunts me because it was the first movie for me that broke the rule. You went to the movies, she went into the truck stop, she never came out? Okay, he’s going to find her. Oh, he’s going to find her. Ultimately to the last frame of that movie, you still believe he’s going to find her. They just ripped the carpet from under you, like no, here’s what happened to her? And here’s how this guy planned to do this for years. Botched attempts, scared attempts. I felt like man, this is that movie. M&C: Did you see the French original? DT: Yes, I did. More dramatic. Scarier, darker. I didn’t even know. I went and watched purposely. Same with The Girl with the Dragon Tattoo. I had heard about the book, and then I said, “Oh, well, I’ve got to watch that.” They were nowhere near the original. I’m like okay, this is incredible. M&C: Were the actress who play trafficking victims game to be this intense and vulnerable for the cause? DT: Yeah, they were great. Those girls were with me pretty much the entire film. As a matter of fact, the girl that we highlight that gets the needle in her arm inside the cave is actually the girl that is taken in the opening frame of the movie. I don’t like to call them extras. They’re actresses. To be able to have them support the movie the way they did, you don’t know but the conditions were very, very hard. We’re shooting up near Lake Tahoe almost Christmastime. Lake Tahoe isn’t all parties in Traffik. We’re literally in caves and these girls have nothing on and it’s tough. They’ve got sweat and blood, we’re freezing, we’re running blankets in when we can and trying to blow heaters. They did it, man. Even to sit in the back of a truck and to be bound and have to do a slam on you with only a camera in there. Some of the girls were overtaken by energy to cry or feel how they felt. I felt the same thing so that’s why in the film I chose to use the Nina SImone song about slavery. They were great. Roselyn Sanchez doesn’t know what she’s getting into in Traffik. M&C: Does Motivated Seller touch on the housing crisis? DT: I wish. No, Motivated is me going back into my thriller world. That’s Michael Ealy, Dennis Quaid, Meagan Goode, Joseph Sikora. That’s a straight psychological thriller with a lot of elements in it. That’s a commercial thriller. That’ll be one people will be like okay, this is insane but fun. M&C: And there’s going to be a Meet the Blacks 2? DT: Yeah, it’s already done. I’m just editing that now. That’s Mike Epps and Katt Williams. We took the movie out of the parody world. I’m just trying to reboot that in a different way to give it some heart, some energy. It’s fun. We’ve got some good stuff going on.